My regular readers will have realised how I love to alter objects! Well this altered box is very special to me as the original box was a lovely fabric covered box that was gifted to my daughter by a crafter blogger friend Tanvi.Since it was a very special gift I wanted to protect the fabric covering from getting soiled.We gave a generous coating of matt Mod Podge over the fabric covered box and the fabric covered notebooks inside!! Its difficult to see in the photo but I added 2 embossed and die cut Spellbinder sentiments “friend” and “inspire” at the corners of the altered box.I am sure you will agree that our Crafty friends inspire us so much!! I used 2 shades of pink cardstock to make the pink roses and also added some super soft white feathers, creamy colored fringed flowers and quilled buds .Here is how I made the double shaded leafy frond:Leaf tutorial. 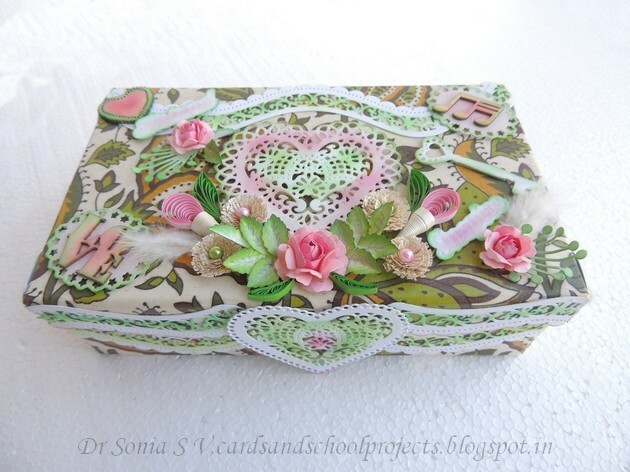 The lacy heart and the lacy arched borders of the box are also Spellbinder die cuts all inked with a dash of green and pink pigment ink.I loved making the lid of my altered box!! I am so thankful to have discovered the joy of crafting, blogging and especially the crafty friends I have made along the way!!! And this altered box which will remind me of the love and generosity of the crafting community will be treasured for life!! Crafting and blogging go hand in hand for me and its only recently I have ventured into pinterest and facebook .I somehow feel crafty friendships are built and nurtured best in blogosphere..what do you say friends? Dear friends Thank you so much for the warm support on my tooth model.Its been a while since I shared a paper flower making tutorial .This is a simple tutorial with some nifty tips to make easy handmade flowers like the big yellow paper flower on this recycled CD case. The CD case is a notebook holder similar to the teachers day gifts I had shared earlier[See link How to recycle CD cases].The silver bow is handmade with silver ribbon and a pink glitter paper strip.The purple roses are quilled roses and the tiny yellow daisies are punchcraft flowers.The big yellow flower is relatively easy to put together and is made of just 6 flowers. Paper-Some handmade flowers [like the roses in this altered project ]are better made with thick card stock while some like the roses in this Punchcraft Rose tutorial require thin punch craft paper.This paper flower tutorial will work well with all kinds of paper! So use easily available chart paper like I did or thick card stock or thin punchcraft paper. Punch, Die cut or cut freehand 6 paper flowers . Use your fingers to crease the petals of the flower as shown .Using your fingers rather than an embossing tool tremendously cuts down the time taken to make your flower! Layer 3 flowers atop each other staggering the petals.Using double sided foam tape makes this a super quick step and lifts up the layers of the flower for a beautiful dimensional effect ! Though many crafters vouch for silicon glue for dimensional flower making it is not my favourite glue as I feel it eats up more time! Chop off one petal and stick adjacent petals together to make a 4 petal flower. Cut up a single flower into 3 , 2 and one petal as shown above. Stick all parts atop with white PVA glue or the glue gun and your quick and easy paper flower is done! You can further jazz up your flower by inking the petal edges and even adding a bit of glitter. I know its a very simple tutorial but I hope some of the tips come in handy to make your own paper flowers. Do tell me how it is. Here are links to more handmade flower tutorials . Dear friends I hope my title has not chased you away but made you curious enough to drop by my blog with a smile on your face! Recently my 7 year old studied the topic "Tooth'” in school and imagine my surprise when she came home reciting “enamel,dentin,pulp”[they are parts of the tooth]….boy that was stuff I had learnt during my medical college days!! The standard of education these days is amazing! She wanted to take a “3 D Tooth model” to class [to show off actually!!] After unsuccessful googling we hit upon the idea of making our Tooth model with play-dough. I cut out the tooth model and glued it on white cardstock embossed with the Spellbinders wood grain embossing folder. Inked parts of the “wood grain” with pinkish red ink and I was thrilled I could achieve the appearance of the bone in which the tooth was embedded! Hope my crafty friends are super sweet and leave me some loving comments on this one! Dear friends being a passionate crafter I often feel one of the best things about living in Bangalore is that the largest manufacturer ,importer and seller of Craft supplies in India, Itsy Bitsy is right at my doorstep! 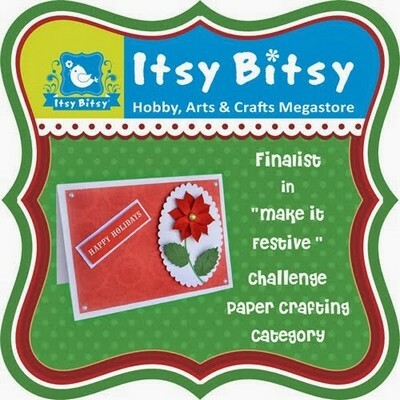 I have guest designed for Itsy Bitsy challenges thrice in the past [Recycled Shadow Box tutorial ,Castle shaped Slider card tutorial ,Origami Basket]but was especially thrilled when Itsy Bitsy owner Rashmi Closepet called me up recently and asked me if I could showcase any newly launched Itsy Bitsy product! Mod podge is a product so many crafters rave about and I had been very excited that Itsy Bitsy now stocked Mod Podge + a beautiful range of MDF products just begging to be decoupaged so I chose to work with Mod Podge in a trice! I am not a professional crafter and most crafty lingo sails right over my head so these tips are a small attempt to demystify Mod Podge and share a beginners travails! What is Mod podge? Is it a glue? Yes Modpodge is a glue …and more! The best thing I like about Mod Podge is you can actually wipe it clean! You may not get away by chucking a mod podged item into a bucket of water but it can take on handling by kiddy hands and some spilled juice! And I love how mod podge transforms the look and feel of a surface! What are the types of Mod Podge and how do you choose one? I agree it can still be difficult to decide which type to use or buy as its expensive and tempting though it is ,one cant buy every Mod Podge variety on the shelf! The secret to deciding is understanding that the different Mod Podge types just vary in the 3 basic properties of Mod Podge I have numbered above! To stick paper /other objects in a scrapbook choose Paper Mod podge[blue bottle]- as its acid free and dries faster. Satin , Gloss ,Sparkle, Glitter ,Brushstroke,Antique,Glow in the dark – can be applied as top coats on your project to get the effect their name suggests. Get either a Matt or a Satin Mod podge. 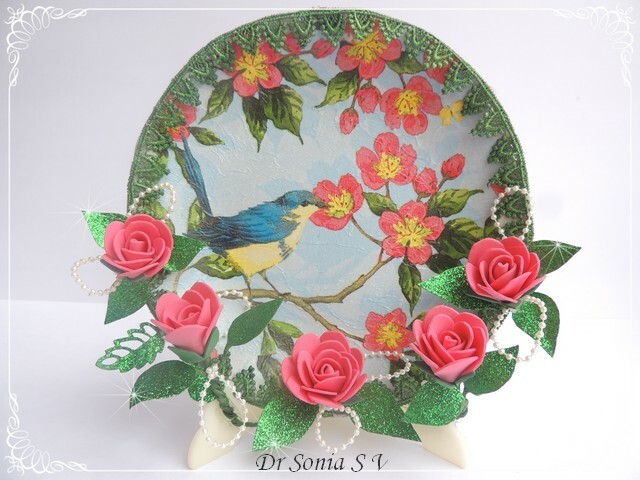 Decoupage is not the easiest or quickest of crafts as it requires quite a bit of patience!There is a bit of a learning curve in decoupage as most of us tend to rush things and in decoupage you wont realise the mistakes till the project is nearly done ! Here are some secrets to be super happy even with your first Mod Podge project. Type of paper -Pattern Paper is the easiest to decoupage. Yes I am a recycling fan and would love to Modpodge with magazines and newspapers but the inks on these papers can bleed when you apply the top coat of your decoupage medium! Thickness of paper –Medium thickness pattern paper is the easiest to decoupage –will stick more easily and wrinkle less.Try napkin decoupage only after you’ve got the hang of decoupaging normal paper! Pattern paper design- a busy design or a natural textured design such as I have used here will hide mistakes beautifully and you can get away with a bit of wrinkling on your project! An object with straight symmetrical sides and flat surfaces like a square or rectangular box is the easiest to decoupage .It will be easier to accurately cut your pattern paper as well as stick it !Believe me negotiating curves and corners is tricky! These tips are brought to you by my 7 year old daughter who has donned the Itsy Bitsy Designer Apron for this project! lightly – no need to put pressure and get indentation marks on your paper! Dont worry if you fall short for one side-If the chosen design of your pattern paper is a busy one you can use bits and pieces and the final product wont show it. Be as accurate as possible in matching the paper to the sides –I found it was better to err in cutting out a paper smaller than larger. Problems if your paper is larger than your decoupage object’s side –it looks unsightly and has an irritating tendency to lift up and to salvage the situation you will have to trim it, sand it or nail file it later [all time consuming un-enjoyable processes] ! What to use to apply Mod Podge – Paint brush or sponge ? Use one with a flatter head and not the bushy type I have shown above as its easier to apply the Mod Podge and gives a more uniform stroke even in nonexpert hands! [see how messy and un uniform the strokes are with the paint brush. You can use the paint brush for the base coat but we found the sponge gave neater covering and uniform strokes which is more important for the top coats. Beware of hairs from cheaper brushes falling off and sticking to your decoupaged surface marring the whole appeal! Sponges soak up a lot of the expensive Mod Podge and if you are a frugal crafter like me you will cringe when you go to wash the sponge brushes and see how much Mod Podge goes to waste! Ha ha what’s so special about that you may ask! Well…everything!! Align the paper on the decoupage object and gently but firmly smoothen out the paper with the edge or your hand or even fingers to get a good adhesion- a key step to avoid wrinkling and bubbling .Alternatives are a plastic old credit card /a stamping brayer/local foam roller from hardware shops. If your paper is of the thinner variety or you are too rough you can tear the paper! After sticking on the paper make slits like above using a sharp pointed scissors or craft knife[ha ha no need to be as untidy as shown here! ]from the centre to the aperture rim,apply Mod Podge on the under-surface and fold over and stick the paper triangles . The most important thing in this step is to not rush to do it!Wait for the base coat to dry for at least 15 mins! We are all impatient souls and yes my kiddo and I did discover what happens if you try to apply a top coat too soon…your paper will try and lift right off!! Apply the Mod Podge in one direction and evenly – this will ensure a masterpiece! Coating the lace with Mod Podge gives a secure adhesion , a nice seal and a beautiful shine to it. I wanted our tissue box to be truly functional so avoided fragile paper embellishments [see an earlier Altered Tissue box]and used some gorgeous Jesse James buttons from Itsy Bitsy [chopped off the backs]. I love the little cup and saucer with the deep pink spoon!The little doggy buttons are my daughter's favourite…which ones are yours? I used regular white glue to stick on all the plastic buttons and to my delight when I accidentally smeared a bit of extra glue on the Mod Podged surface I could wipe off the glue without leaving any stain—thats the magic of Mod Podge! Though decoupage is not a kiddy craft I purposely let my young crafter undertake it to see what would be the mistakes a beginner working with Mod Podge would make..I hope our tips will prove beneficial.